DC has problems. Always. Unequivocally. DC's heavily rebooted comics are frequently a laughing-stock; DC's attempt at ripping off Marvel's cinematic universe have been abysmal, and DC's TV offerings swing wildly in quality, from terrific to dreadful, sometimes across a single episode. In particular, "The Adventures of Scowleyface" (Arrow), a series which seems hellbent on ruining itself across each season, has a particularly frustrating problem with women. The ways in which is treats its female characters is deeply troubling, running the MRA gauntlet of characterisation that often leads to death, coupled with a dark tone that it rarely earns. Fortunately, there's a nice counterbalance to this nonsense, and it's Supergirl, a significantly brighter, cheerier show that is now joining the CW ranks and will cross over with the other DC TV series. Kara Zor-El, played by Melissa Benoist, is a chipper lass willing to fight the bad guys with an ethos of optimism and grace. She and the similarly chipper Flash (played by Grant Gustin) had great chemistry in a crossover last season, and it'll be curious to see how she deals with the ever-dark and idiotic Oliver Queen over these coming weeks. 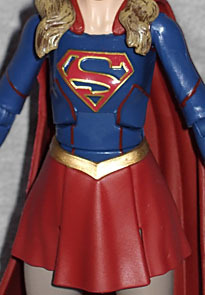 At 12 years old, Kara Zor-El escapes doom on planet Krypton to find protection on Earth with the Danvers family, where she grows up in the shadow of her foster sister, Alex, and learns to hide the extraordinary powers she shares with her cousin, Superman. Now an adult living in National City and working for media mogul Cat Grant, Kara finds her days of keeping her abilities a secret are over when super-secret agency head Hank Henshaw enlists her to help protect the city's citizens from threats. Finally coming into her own, Kara must juggle her new responsibilities with her very human relationships. 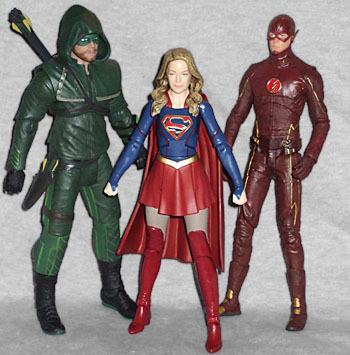 DC Direct already covered Arrow and Flash in toy form with some pretty terrific action figures, nicely capturing the likenesses of Stephen Amell and Gustin as well as their surrounding characters, and it's pleasing to see Mattel has picked up the reins here and delivered a very nice 1:12 scale Supergirl. They've also made their own Flashes and Arrows, so now all we need is Rip Hunter, the Dumbest Time-Traveller Alive! 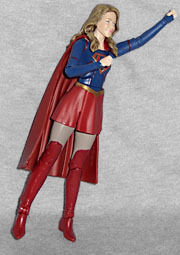 Photos don't quite do this justice - this is a very nice sculpt of the lovely Melissa Benoist, recognizable from all angles. 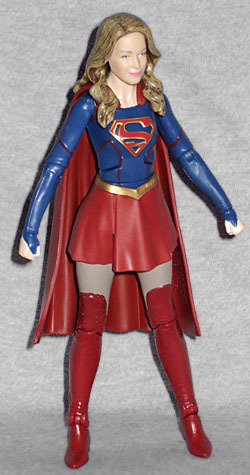 The entire costume is captured here very nicely, a modern twist on the iconic Supergirl garb. Paint aps are quite good, though you'll want to take a close look at the figures on the shelf to make sure they've got the eyes right. The toy gets squinty really easily. Articulation-wise, this figure is an improvement over the earlier DC Direct figures, with a nice array of joints including balljointed shoulders and neck, then joints at the knees, legs, elbows, wrists and feet. She isn't quite flight-ready: the balljoint at the neck is slightly impeded by the sculpted hair, and the feet articulation is limiting. Her closed-fists also provide a good case for interchangeable hands. But as she is, this is a nice sturdy figure with a lot of play and plenty of movement. Accessory-wise, she has nothing at all for herself, only a leg piece of the garbage-looking New 52 Doomsday Build-A-Figure. This thing looks so lame I nearly forgot to get a photo of it, and it now resides in my Plastic Bag of BAF Pieces I'll Never Complete! Other than that, nothing. I'd have liked a flight stand, but one can make do with any number of Marvel Legends or Japanese figure stands instead. So, this is quite a nice figure, and exactly what I was chasing to fit into my Arrow/Flash display. 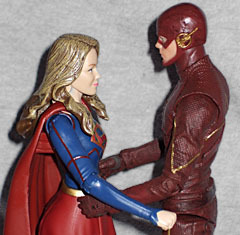 Mattel's line has always had a problem with scale, but this Kara goes quite nicely goes alongside those DC Direct figures so you can pair up Supergirl and Flash to act out your fan fiction fantasies to your hearts content. Or maybe she'd prefer a bad boy instead. One who always scowls and is always tortured.